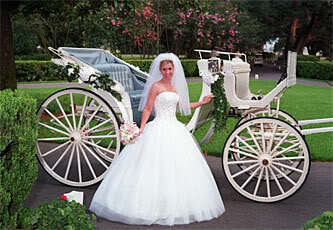 You are desperately looking for some great Cinderella wedding ideas for that special day. You never quite got over that childhood dream of having a Cinderella theme wedding. Read on to find just a few great ideas to start with on your road to a spectacular wedding you'll never forget. One of the most important parts of a Cinderella theme wedding is the bride's grand entrance. Of course, you'll need a pumpkin coach or carriage. Be creative when it comes to the entrance, and make it as similar to Cinderella's entrance to the ball that changed her life. You can have a horse-drawn pumpkin shaped carriage or have one built to match the one all girls know all to well. As for decoration, make sure there is plenty of white and silver as these are the colors that are most commonly associated with Cinderella and her glass slippers. You can have medieval décor for your reception such as large candles or torches along the walls of the castle reception hall. 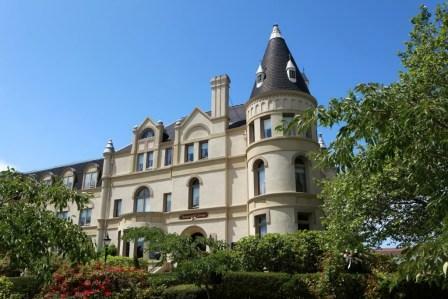 Or, you can have your reception on the gardens of a castle or chateau, allowing for a beautiful view of the structure in the background. Amazing photos are guaranteed. 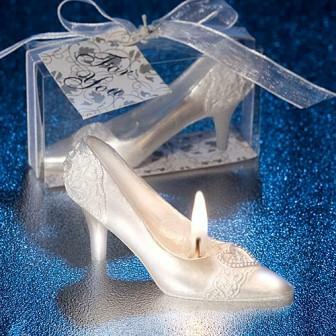 Cinderella wedding ideas for centerpieces and favors abound. You can choose to have a huge glass slipper as your table centerpieces. These glass slippers can be used as vases, or candy holders. Either way, they are sure to catch your guests' eyes. You can also use tiny glass slippers as your wedding favors. Another great idea for centerpieces and or wedding favors is to use crystal and diamond tiaras. These will help give your reception a royal feel to it and you can play several different wedding reception games to see which lucky guest gets to take the beautiful centerpiece home. So, if you decide to work to make that Cinderella theme wedding dream a reality, you now know there are endless ways to make it a fairytale event.